An experience is a cumulative of the 5 human senses on various levels. A memorable experience is one that stimulates each of the 5 senses to a certain measurable degree. Designer Jinsop Lee, in his Five Senses Thoery, says that any experience can be graded on all the 5 senses. For most learning environments, sight, sound and touch are usually high or, are active components of the experience. The sense of smell however, is often involuntary or is used as a secondary device. Memories are known to be associated with smell. The scents of rosemary, lemon, lavender, and orange can help improve memory in Alzheimer’s patients. The smell of citrus can motivate people to clean their homes. And sniffing spiced apples can lower blood pressure. Then why is it that smell is not actively used for associative learning. As Alex Kauffmann, in one of his project documnetation puts it, “Smell is subjective, it’s ephemeral, and it’s not binary.” Experiencing smells is a gradual process that has a certain delayed gratification. 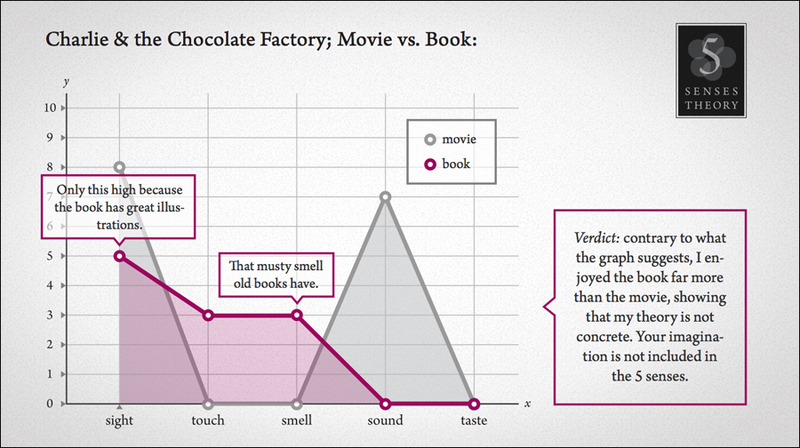 In terms of interactivity, olfactory feedback is not easy to detect. Scents waft, and are hence, difficult to control and manipulate in space. Vocal practice of Indian Classical Music is often a solitary experience that involves creating certain rituals for oneself. For example, one usually practices at a set time (ideally in the morning and/or evening – sunrise/sunset), drinks warm water an hour before practice, sits down on the floor etc. During the practice, singers becomes more and more involved in their own music and less aware of what is around them – meaning they respond passively to some external stimuli. Most singers I know, close their eyes when they practice and their sense of touch is occupied in determining the ‘taal’ (or beats). 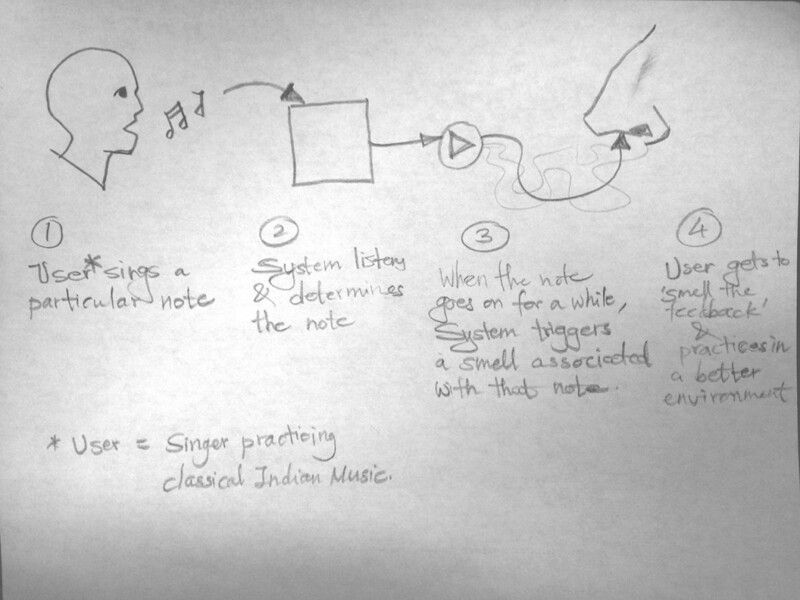 For our final project we want to explore this complex interaction between sound and smell within the constraints of a tool that helps people learn how to sing the basic notes in Indian Classical Music. Each time one hits the exact frequency of a note, ‘the device’ sprays a certain scent as an affirmation of the same. When the singer is on the right track, the affirmative smell starts to become more condensed and subsequently, apparent to the singer. This gradual build up of the smell when the singer is consistently performing well is in perfect harmony with the process of vocal practice, that, just like these smells grows and becomes stronger with time. 1. takes in frequency inputs from a microphone and it gives out an olfactory output for the user to experience. This device is targeted at users with a certain musical inclination who are willing to learn Indian Classical vocal music and tries to slightly emulate the experience of one-on-one learning from a teacher or ‘guru’. 1. Tanpura(string instrument) Emulation – Plays 2 base notes that act as a guide to sing the other notes. 4. Feature to send/share progress report with their music teacher? When does the user anticipate a feedback? Does the system give a feedback on successful completion of full octave or for every successful note? What is the form factor? Is it a product that sits in front of the singer or is it an invisible, ubiquitous system in that room? Should it be combined with a Tanpura (an electronic device similar to metronome that creates an aural canvas for the reference)? How intense and how quick should the generation of smells be? Dhruv has blogged about the results from the first play testing exercise. You can read about it here. How did playtesting go, and what did you learn from it?